The Ancient Temple - The Chip's Challenge Wiki - The Chip's Challenge Database that anyone can edit! Explore the ancient temple and find the Mystical Chip of Epic Coolness. 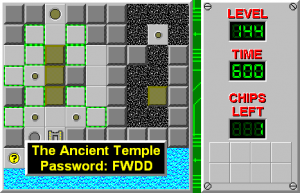 The Ancient Temple is the 144th level in Chip's Challenge Level Pack 1. It was created by Eric Schmidt. This level is all about moving blocks to retrieve keys, gradually opening locks until the single chip may be retrieved. 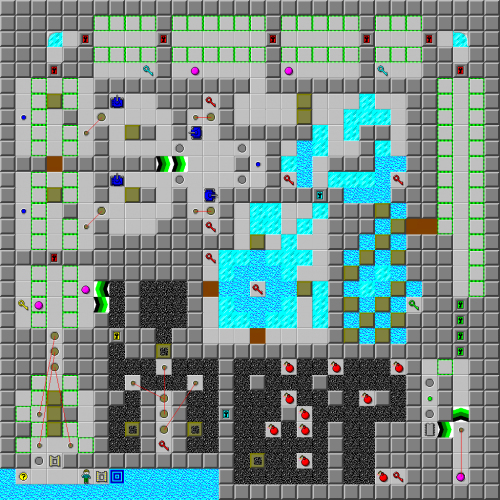 At that point, a green button closes off all rooms, leaving only one long corridor back to the start/finish line. Chip is chased by a ball and must deftly stop his momentum at the end to avoid drowning. A light touch and puzzle-solving skills are all that is necessary. This page was last edited on 26 February 2019, at 04:22.